As expected, the California State Athletic Commission has suspended middleweight Chael Sonnen for his failed UFC 117 drug test. Sonnen captured the hearts of MMA fans with his hilarious stand-up comedy routine and nearly-flawless performance against middleweight king Anderson Silva this past August. Unfortunately, after word broke on Sunday that he allegedly used a performance-enhancing drug prior to the biggest fight of his life, the chatty challenger immediately became the sport’s ultimate punchline. The California State Athletic Commission (CSAC) has suspended the license of Mixed Martial Arts (MMA) fighter Chael Sonnen, after Sonnen tested positive for steroids, a banned substance. A sample from Sonnen’s August 6 drug test came back with a high T/E (testosterone-to-estrogen) level, which is indicative of anabolic steroid use. CSAC learned of the results September 2 and ordered a second test, which also came back positive for steroid use. CSAC received test results from the second sample on September 14 and suspended Sonnen two days later. He is suspended for one year. Sonnen has 30 days to appeal the decision. 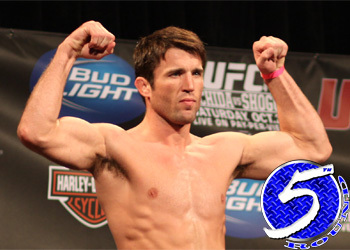 Sonnen’s test was observed in the presence of a CSAC representative and the sample was sent to the World Anti-doping Agency test facility at the University of California, Los Angeles on August 6, 2010 for processing. Sonnen will appear as an in-studio guest tomorrow on ESPN2’s MMA Live. The 33-year-old has yet to address the controversy publicly.